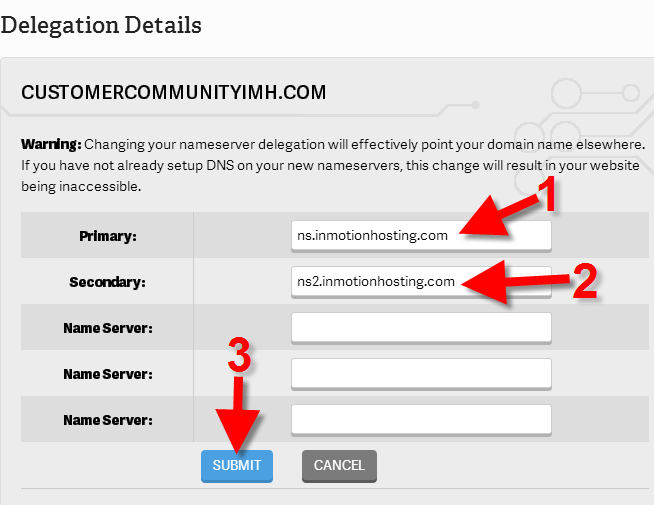 You have access to change the nameservers of any domains registered with InMotion Hosting. 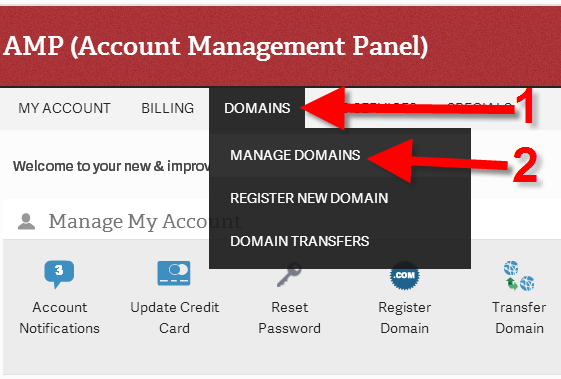 You can make any changes to the nameservers in your Account Management Panel (or AMP). Since changing nameservers is a DNS change, it can take up to 24 hours to propagate. On the main menu, roll your mouse over Domains and click Manage Domains. Next, select the domain that you want to make the nameserver change for. Click the Point your domain link. Finally, enter your primary and secondary nameservers. Remember that you will always need to enter two nameservers. Once you are done, click Submit. You will then see a message stating "Your request has been completed"
Important! Important! If you are only pointing your domain to your server IP address, you will need to do this where the nameservers point. 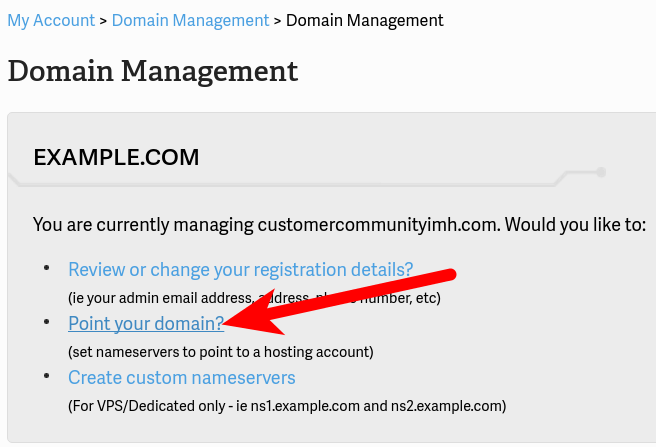 If you are pointing your domain from our server to another server and wish to keep the nameservers pointing to ours you can edit the DNS zone A record. This is common for those with accounts at Weebly, Blogger, Squarespace etc. How do I point my domain name to another host? How do I change my name server to ns1.wordpress.com, etc? 403s & switching InMotion nameservers from Cloudflare - the big "Oops"
Hello !I am writing to you about my domain name. I have registered my domain name for a few months now and have not used it since. Now that I want to upload my site I realize that the domain name does not work anymore while my subscription is active. I obviously checked the addresses of Inmotion servers to see if anytime the problem did not come from there. But the problem seems not to come from there, because the names of the servers are correctly configured as indicated on the support page.Despite all these acrobatics the field still does not work.So I thought it would be wise to ask for help in the forum.I hope I have been clear in my explanations.NB: sorry for the content of my English (I am not English). Did you register the domain with InMotion Hosting or another registrar? I have a domain name through Crazydomains and thought I pointed the name servers to Inmotion Hosting but when I put the domain name in a web browser there is an error notice. Do I just put the inmotion nameserver info into the nameserver section on crazydomains or is there something else i have missed to do. It has been months since i redirected it, well thought i redirected it? Yes, you should only have to point the domain to InMotion Hosting. If you are unsure of whether these settings have been entered correctly, you will want to check with support at the registrar. Otherwise, if the nameserver information is entered correctly and there are still errors, feel free to check in with our Live Support team anytime. Do I replace the current first two listed NS records with the first two of the above? Do I add these? If I do replace the current first two NS records and add the ns3 and ns4 records, is it just email that is redirected to the MS servers, or does much more go that way, too? Are there other, better instructions/methods for this? If you change the name servers for your domain, then you will not be using our hosting service. You need match the scenario that best fits how you want to run your hosting and email services. If you want to keep InMotion Hosting as your web server, then you may need to have your email services changed so that they are using Office 365. Check out this Microsoft Documentation. It may help to clarify how you're setting up Office 365. If you require further assistance, you may also want to check Microsoft's resources for setting the server or services that you're trying to use from them. Name server changes determines where the DNS for your domain is being controlled. If you change it, then DNS changes to maintain your hosting services will come the Microsoft server. You will need to make the decision on where the DNS will be controlled and how you want to configure your web service and email service. They can exist in different spaces based on how you want to configure them. Can I choose to have InMotion host a .gov domain? You can select any TLD (top level domain) for your website, but we can't register and manage various domain types. .GOV is cannot be registered through our Domain Registration services. You can see the different domain types that we do support on this page. I have another problem, My Domain was registered last year in webjow, but currently my hosting is inmotion hosting. I'm stuck with adding CDN to Site. Because ib the domains at inmotion hosting, nothing is their. there is no domain. Hello. You would need to transfer the domain registration rights to InMotion Hosting, if you wanted to be able to manage the domain from your Account Management Panel (AMP). This is because AMP only allows access to change the nameservers of any domains registered with InMotion Hosting. Since you registered the domain with Webjow you will need to reach out to them to change the name servers and/or to request a domain transfer. I purchased a domain from InMotion Hosting a few months back, However, I need to transfer/point to another hosting site. Will following the instructions above allow me to do this via AMP? Yes, pointing your nameservers in AMP will cause your site to resolve to the new hosting site. If you want to transfer the actual domain registration, you can Transfer a Domain away from OpenSRS. You do not have any domains to manage. Since this point I do not know where to go for. This guide is specific to domains that we are managing for you. This means the domain would have either had to have been purchased through us, or have transferred to us. While you can still change the name server information for the domain, you just have to log into the current domain registrar to do so. hi, i just bought my domain, however I would like to change the name, I just want to add (www.) at the begining, yes I did not add it before. Can you please tell me if it is possible to do it? No worries. You don't need to change the domain name. This is done through the programming of the site itself. You can merely force your site to use www instead of non-www. Both will work with any domain. Hi John. How and what setting can I change so that I point my domain so that it redirects to my facebook page? I'm not a techy and I do not have a hosting plan with you so I cannot access the cPanel. Unfortunately, you cannot redirect a domain name directly to a Facebook profile. can i use multiple servers in my account? CloudFlare give me the new nameservers, so can i update these servers into Primary and secondary or write these into these into new nameservers. Yes, just replace the existing nameservers records, and enter your cloudflare nameservers as described above. There is also some additional information on our Setting Up Cloudflare with your website article. I think it's been around 24 hours. I'm still not seeing our domain, just the IP numbers. Be sure you have added the domain to your cPanel (or created cPanel accounts if you have a VPS/Dedicated/Reseller account). I have a Pro Plan account and I Just registred two domain names, the two domains are pointed to my account nameservers but still can´t ping the domain names. 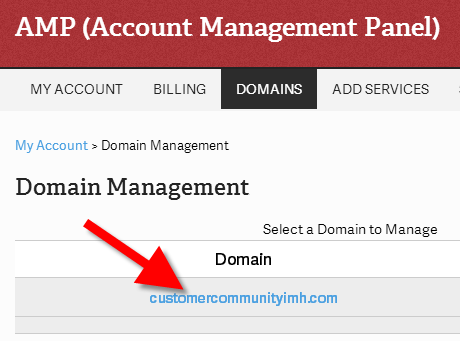 The 2nd question is can I manage the two domain from separate cpanel. Thank you for contacting us. Ensure you have added the domain to your cPanel (or created cPanel accounts if you have a VPS/Dedicated/Reseller account). Alternately, you can purchase multiple hosting accounts to have separate cPanels. I followed the vanity nameservers article, and created two A records for my domain manxin.info. I received error "There was a problem with processing your request. Ensure that the nameservers you are trying to set have been created." Is it a bug in AMP as mentioned in previous comment, or did I do something wrong? This may have been due to the AMP not able to ping the nameservers at the time when you were making the change. I would suggest to try again and if it still fails, please contact our support department as they can manually make this change. Thank you for contacting us. Yes, it is possible, but is not a common setup. It can create issues, since visitors may be resolving to different servers. For resellers, is it possible to set custom name servers like ns1.myreseller.com and ns2.myreseller.com? Thank you for contacting us. Here is a link to our guide on Using Custom Nameservers as a Reseller. I am trying to change the domain name from all lower case to upper case letters. I found what I think are the correct instructions, but it is telling me to remove my "cancel my domain privacy", make the changes then add domain privacy back. Will the system charge me again for doing this change? Maybe I am misunderstanding what I need to do. Thanks for your help! Thank you for contacting us. I recommend contacting our Billing department, if you want to change your bill item to upper case. But, keep in mind domains/URL's are not case sensitive, meaning it will not change the way it displays in a browser. There was a problem with processing your request. Ensure that the nameservers you are trying to set have been created. If they have not, you can go here to do so. How can I change it? Thanks. Thank you for contacting us. Unfortunately, this is a known bug in AMP currently. Please submit a ticket to Live Support with the nameservers included. They will make the change for you, and email you back to confirm. Thank you for your patience, while our development team works on a solution. Thanks buddy for the detail information, helped me setup the nameservers quite easily. I'm trying to change my nameservers to point to cloudflare. I can't seem to find where to do that. In the AMP, it says I don't have any domains to manage. Thank you for contacting us. If you purchased the domain under a different email address, it's possibly in a separate account. You would have to login to with that email address to manage the domain. Live Support would be happy to help you look your account up as well. If you are not sure where you purchased your domain, the Registrar is listed in the WHOIS information.